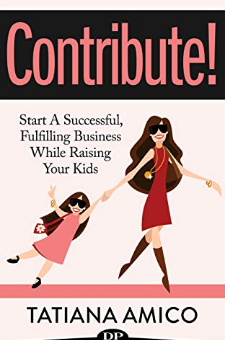 Build a successful business while staying home with your kids!You want to stay home with your kids, be able to take them to activities during the day, and be there to pick them up from school. But you wonder how you can be emotionally present for your kids while also financially contributing to your family. You can create this life by building a business from home, and best of all, you don’t have to give up being the mom you want to be.In Contribute!, Tatiana Amico, a successful entrepreneur and mom of two, shares her secrets on how to build a successful business that supports your family, all while being there for your kids' milestones! She will show you how to:Figure out what kind of business to start (even if right now you have no idea what it could possibly be)Identify the reasons why you haven’t already startedLearn how to make your business work with the time you haveDevelop skills necessary to build a home-based business you love, and make it a wild successIf you’re finally ready to build your business and make some money, doing something that you’ll actually look forward to, don’t waste any more time. Contribute! now.